My amazing husband decided to put on a three course meal for me last night, with the entree being Garlic Prawns. I'm going to have to tell you about the rest of the night in another post, but I just had to share this recipe with you. These Garlic Prawns are the BEST I have ever had - absolutely delicious!! 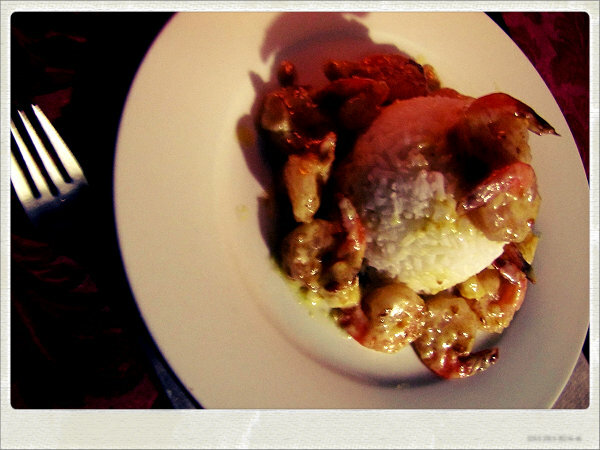 Because it was dark, my photo isn't the best - but seriously, these were so good... tender, juicy prawns in a rich, creamy garlic sauce (hubby found the recipe here). Purchase around 475g of headless, unshelled green prawns for this recipe. Serves 4 as an entree. Cook rice according to the directions on the packet. Drain and keep warm. Heat butter or oil in a frying pan or large saucepan over medium-high heat. Add prawns and cook for a couple of minutes, until prawns have just changed colour but are not completely cooked through. Turn prawns once during cooking. Reduce heat to low, stir in garlic and cook for about 30 seconds, being careful not to brown garlic (it can develop a bitter flavour). Add cream and increase heat so that the mixture is simmering rapidly. While the sauce is reducing (keep an eye on the sauce to ensure it doesn't reduce too much), spoon one quarter of the rice into a mould with about ⅓ cup capacity. Using the back of a spoon, firmly press the rice into the mould. Invert mould onto a serving plate, tap on mould to release rice and lift mould away. Alternatively, use a ring mould. Repeat with remaining rice. Simmer sauce until it has thickened to the desired consistency and prawns are cooked through. Stir in basil and remove from heat. Place 4 prawns on each plate. Drizzle prawns with sauce and serve immediately. Word verification was cancer, first time I actually have come across an actual word that is in the dictionary.. although "cancer"... negative much. What a great hubsy! I dont usually like seafood, but that is looking appealing to me! what time should I be there??????? ps what a good hub you have...silly and a good cook...nice combination! A three course meal cooked by your hubby? Lucky you! thanks for your sweet comment on my blog. I'm not your newest follower! Cheers! YUUUUMMMM! Anything with basil takes the cake!